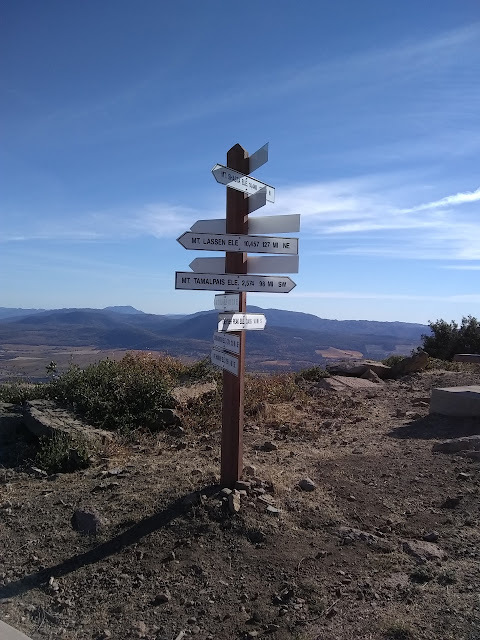 If Mount Saint Helena is special for having 1000 foot prominence, then Mount Konocti is twice as special with 2000 feet. Unfortunately, getting to the top is another road walk, but that doesn't change the view at the top. Also unfortunately, it turns out my 120V outlets in my little trailer don't run off the battery, so my camera battery is still dead and I must contend with splotchy pocket computer (for some reason known as a phone) photos. Trail parking and a picnic area are at the end of 3 miles of well graded dirt road and a map is posted just before the gate. There are a few named peaks on the mountain, but the very highest is Wright Peak, so that's what I'm going for. The start of hiking. The gate prevents motorcycles and horse from proceeding. Dogs are also not allowed. The road past the gate is nicely graded too and easy walking. The one bit of trail comes quickly. It skirts around the edge of a walnut orchard rather than wandering right past the house that goes with the orchard like the road does. Some steps at the end lead back up to the road to resume the gentle upward walk along it. Views are what you make of them. There is a bit of brush and trees in the way, but breaks in this are often. Looking over farms to Clear Lake, the lake of Lake County. 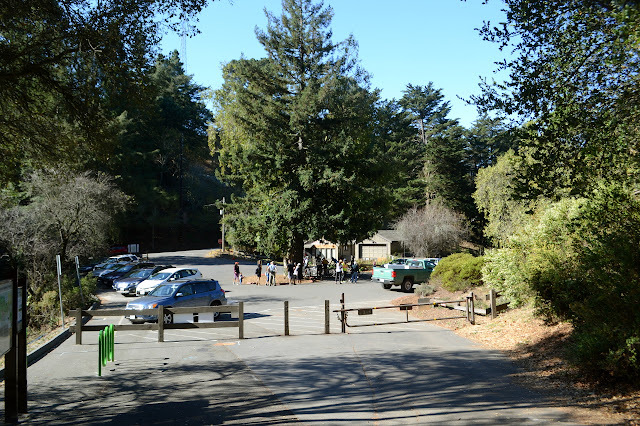 Mount Saint Helena was on my radar long before seeing it as the highest mountain on the San Francisco Area Nifty Ninety peak list. It was my real desire when I came out and hiked Table Rock and that was renewed when I saw it has over 1000 feet prominence. From the top, if you want to get any higher, you've got to come down a thousand feet first. It sticks out a bit from the rest of the landscape. The largest parking is in the same huge dirt turnout available for Table Rock. There is also a little on the other side of the road. The trail climbs to a utility road and there is a little more parking at the bottom of that as well. The big lot has plenty of room, so I go for that and then have to cross the highway to start. 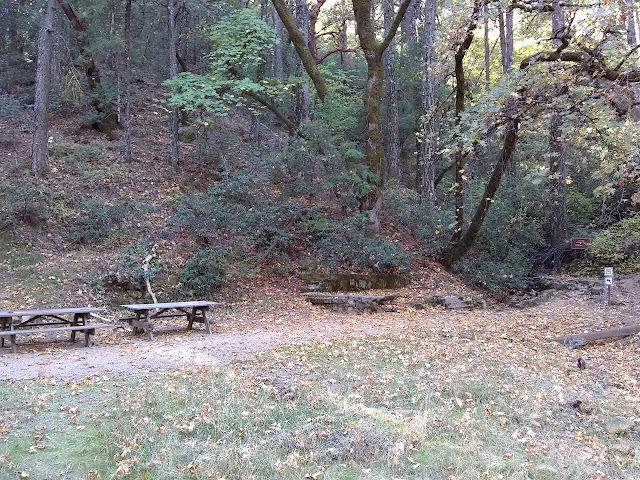 The start of the trail includes a large picnic area with a few old steps going nowhere. There was a bit more here once. No dogs are allowed past the picnic area. My camera battery is dead. It had a light shining as it sat under my pack on the way home last time. I didn't think it was for that long, but apparently I drained the battery. All pictures will have to be from my little pocket computer with something like a camera on it that likes to despeckle and sharpen and otherwise overdo the processing until the photograph is a series of flat color blotches. It should look okay at the level of a web page. 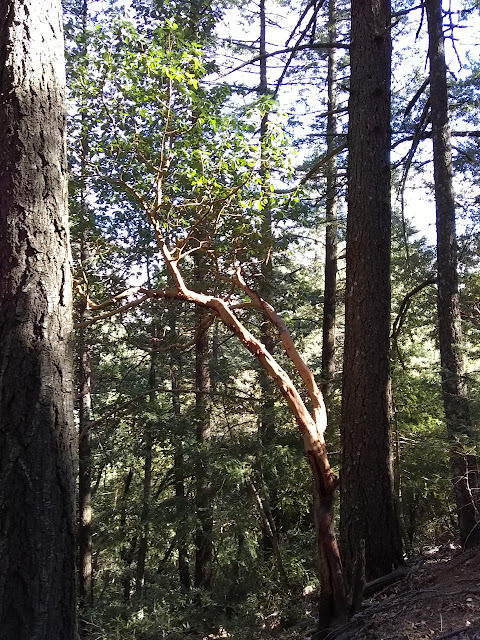 A small madrone takes advantage of a spot of light. 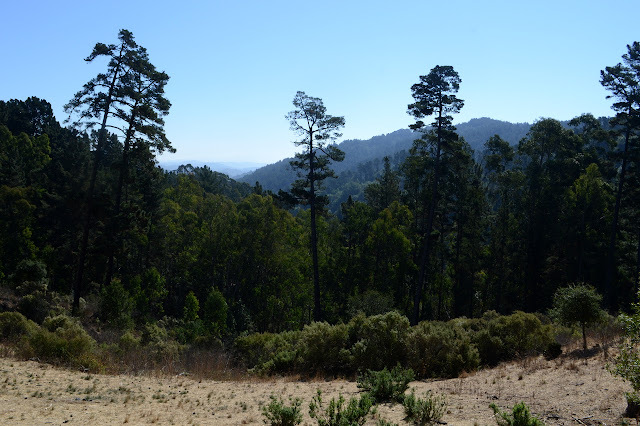 The trees are pine and similar in the more sheltered areas of the mountain, but madrones pop up as it gets less so and manzanita as it starts to bake. I put in a few geocaches to find along the way having forgotten how consistently way off trail they were on the way to Table Mountain. They are well off this time, too, but sometimes they actually bring me to something. The old roads around that are still faintly visible must be from mining, because that is what they take me to. 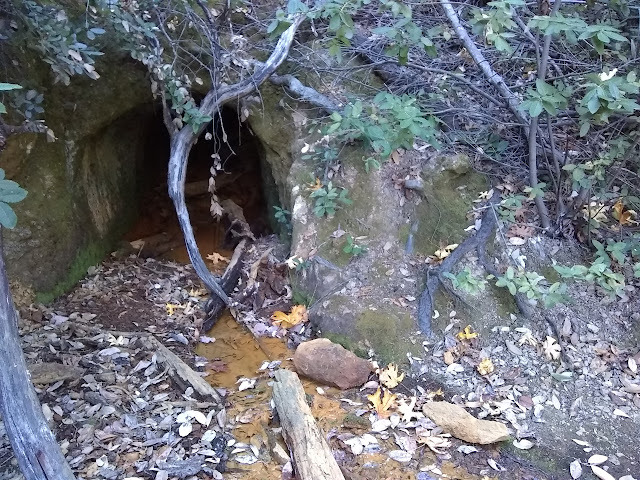 Whatever was mined here before, it is water that comes out now. This is down a side trail off a bit of abandoned road. 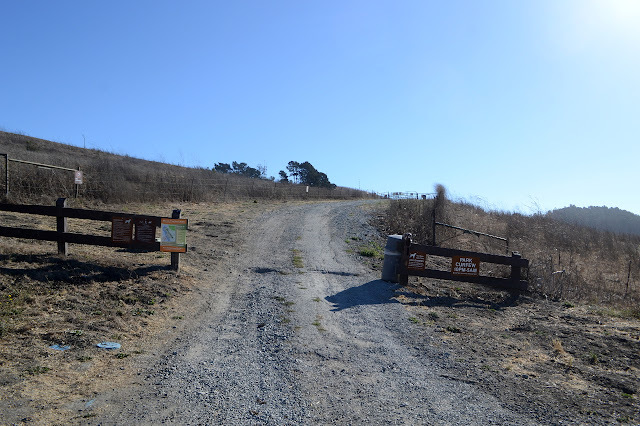 I finally noticed that the East Bay Regional Parks have a trails challenge on. In fact, this is the 25th trails challenge that they have done. They have descriptions for 20 trails in the park system and challenge folks to hike 5 of them or a marathon worth of miles. 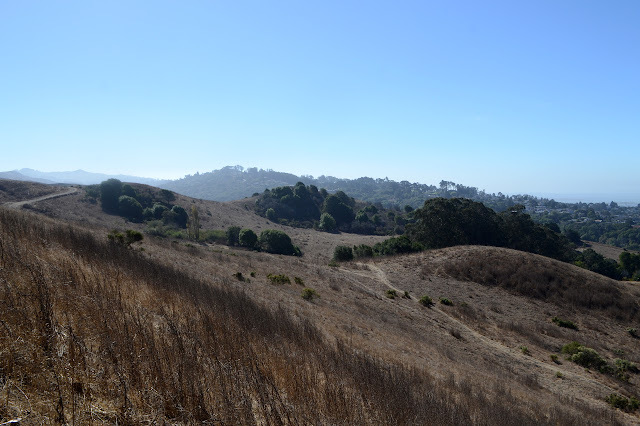 My original plan for Round Top closely resembled one of their moderate hikes and my loop around Wildcat surrounds one of their challenging hikes. They also have one for those hills I was glancing over at from Redwood that just happens to pass closely by three more of the San Francisco Bay Area Nifty Ninety peaks so I decided to try one as described. Well, as described with the addition of the tenth of a mile or so needed to actually get to the top of each peak along the way. 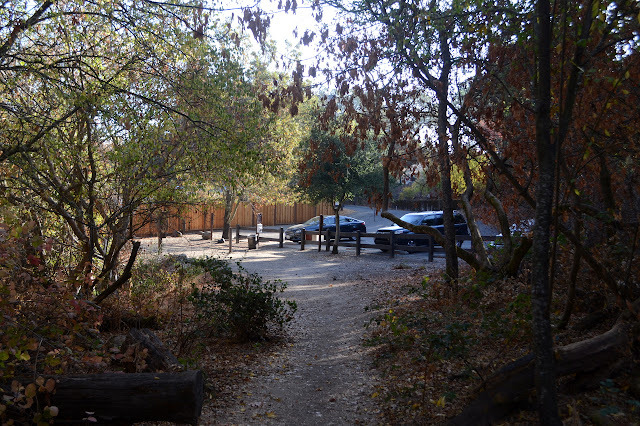 Ringtail Cat Trailhead only has a few spots. Perhaps there is some plan for an ADA approved trail because 1/4 of them are wheelchair accessible, which seems of dubious value as things are. The trail is a little cool in the morning as it passes beside dry creek bed. I stop to ponder an old pump, then continue on. A junction offers a route to more parking or a shortcut for the loop, but my way is up. Up is a bit of work, but it comes with views, first through small windows past the trees, then bigger, and finally a few expanses. These really are the hills I was seeing in front of Diablo, so that Mount is part of the view rather clear view. A little mist is in the bottom of the valley, but it is burning off quickly. A little bit of fall color visible in this larger window onto the Diablo Foothills. 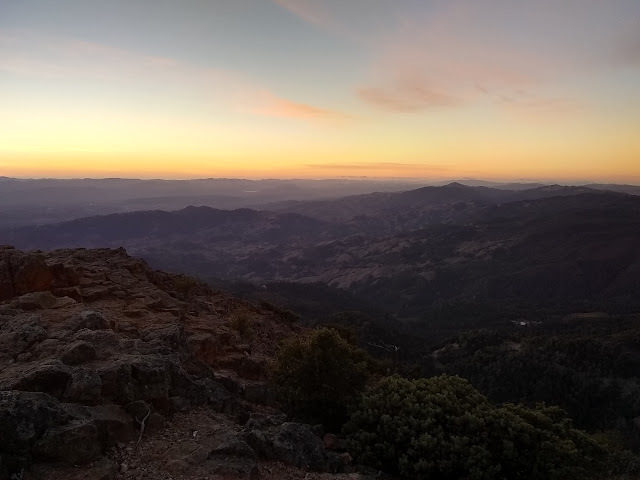 Mount Diablo and its long ridges. This is another area where they have cows. I'm not certain what makes it a wilderness rather than park or preserve, but apparently cows can be a part of that. There are plenty of their fresh leavings to avoid on the fire roads and a few of them (actually, plenty of steers, too) to make their presence known. 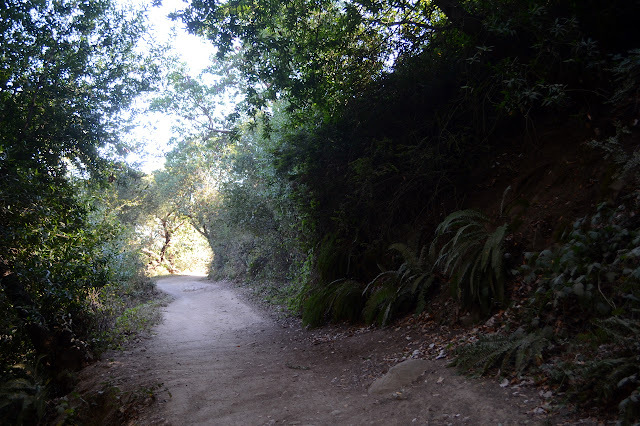 Turning onto the Madrone Trail. I am fairly certain there are wild turkeys moving around on that far hill. This is just a bit of afternoon wandering in the local park area. 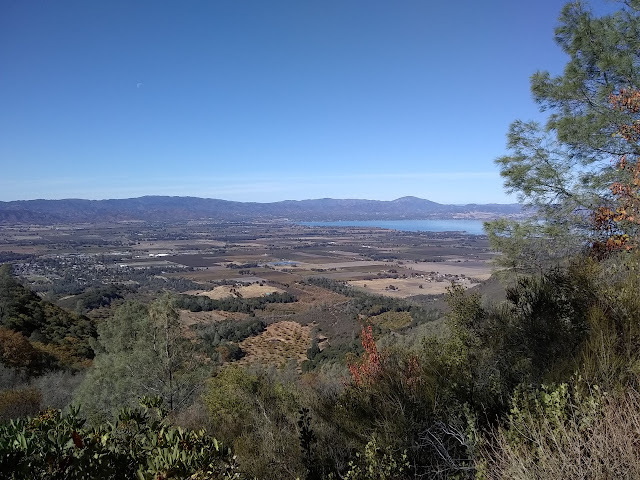 I can climb up a little from the end of Silver Belt Drive to get onto the Manzanita Loop Trail, or I can take a fire road just short of the last house to get over to a slightly more official entry point. That point has brochures including area maps below informational signs. In comparison to a sign marking the boundary, it might be a lot more official. 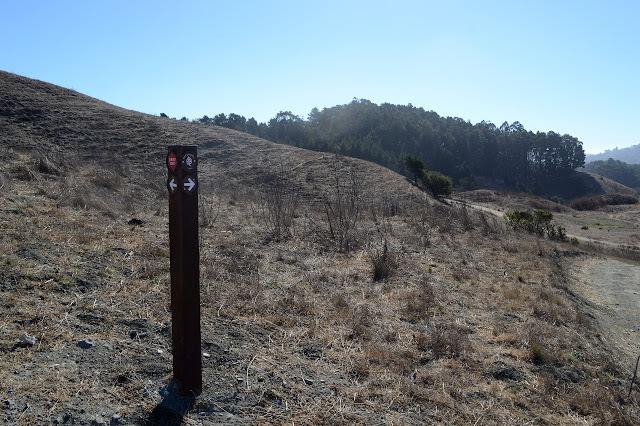 The two trails join quickly and then connect with the Sobrante Ridge Trail. 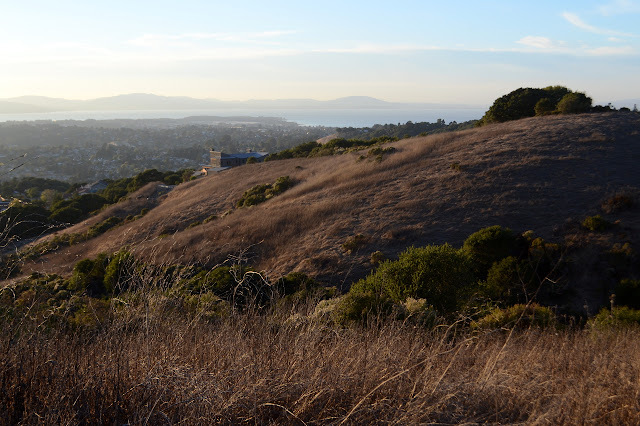 This is another part of the Bay Area Ridge Trail. I head north on it, soon coming to some picnic tables with a view of the bay. Ready for a picnic above the cities and the bay. 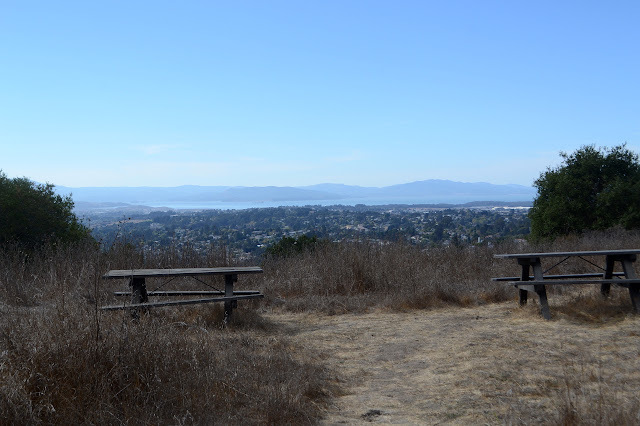 Mount Tamalpais is viewable off to the left just a few steps from the tables. 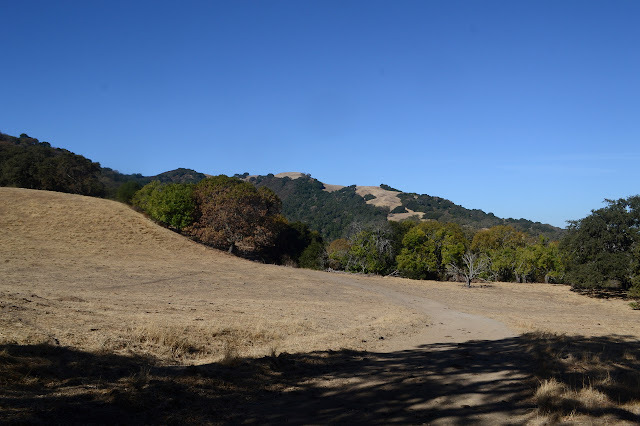 Past the tables, there is an intersection and the ridge route swings out toward Mount Diablo. 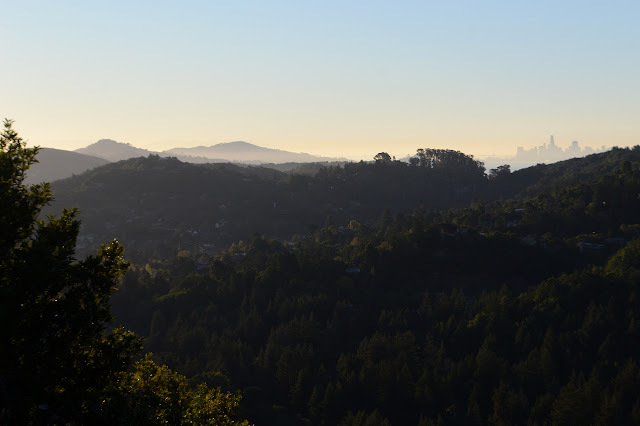 Mount Tamalpais is also a murky bump to be seen toward the afternoon sun. I follow it as it until approaching another neighborhood. 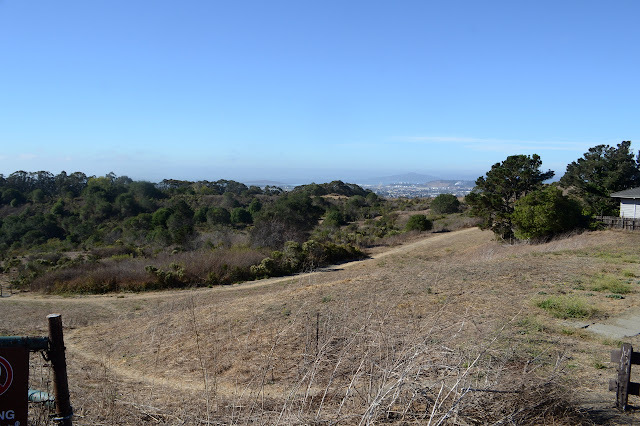 There is a trail off to the side into East Bay Municipal Utility District land, but I have not got a permit for that yet. 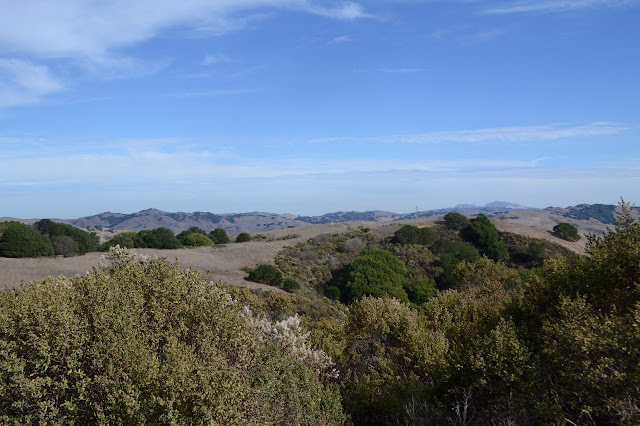 The grassy ridge ahead as it turns east with little Mount Diablo bumps easily seen in the distance. 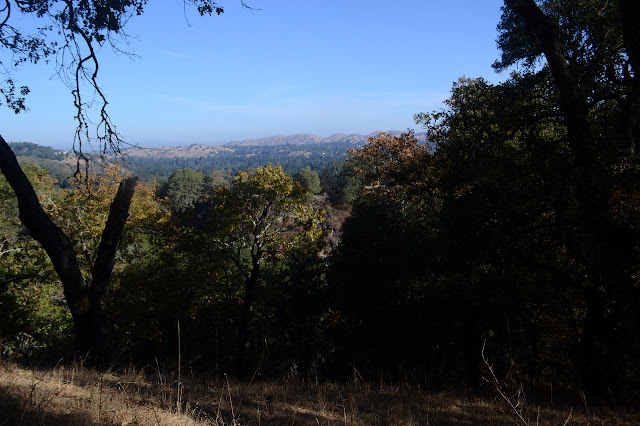 My original thought for Round Top in Sibley Volcanic was a short hike and then take off for a longer hike at Redwood, but I went and gave it a little more time like it deserved and then there really wasn't the time for the longer hike after. So now I am back to put that previous plan into action. After accidentally going down Pinehurst (scariest road with a painted double yellow line I've ever seen as the outside is slumping downward and the inside doesn't have enough room to travel and there is traffic so you better stay on your side anyway) I was done driving and parked at the intersection where there are some dirt spaces. A proper parking lot is not too far along if you can stick to Skyline. The Ridge Route cuts through here for easy access to the park, so I can just start at the corner beside a park bench and get a little climbing going before dropping into the top of the valley. And there it is, the valley. Somewhere down there is Redwood Creek. The trail pops out at a road full of people and I turn right, taking me to the parking lot where most of them started. The lot is nearly full. There are maps available here and I grab one. I want to follow the West Ridge Trail until near the peak, then bag that thing and keep on going until I feel like it is time to return via the Stream Trail and East Ridge Trail, one way or another. As I continue along the road past the parking lot, there are fewer people. This side has more shade, but the day is not particularly hot in the sun. I seem to be hanging out with historic Juan Bautista de Anza again. Bay trees and redwoods and ferns for a shaded bit of road. Looking back at Round Top. Not all that far away. I get glimpses of view off toward the east as I go. Just over the near ridge, I can see some bumps that might be interesting to explore. I look them over while lounging on a bench with my snacks, then return to here. I still haven't even gotten to the peak. 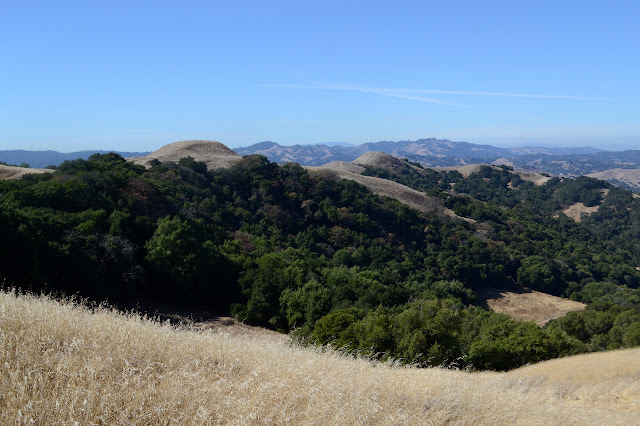 Mount Diablo is out there, but there are also some lower hills in front of it. 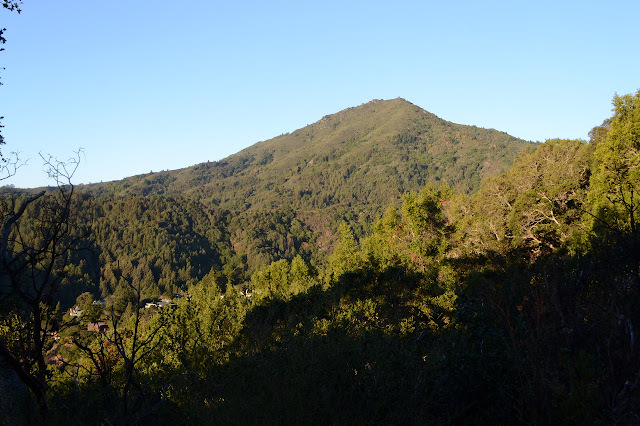 Mount Tamalpais, which is actually just called "Mount Tam" by the people around it, is another one that one could be climbed by a long wiggling drive and a short stroll. However, I don't want to just be there, I want to have journeyed there. There are lots of ways to really hike up it, too. I chose one that looked like it would be an easy drive and let me loop around King Mountain before tackling the big stuff. 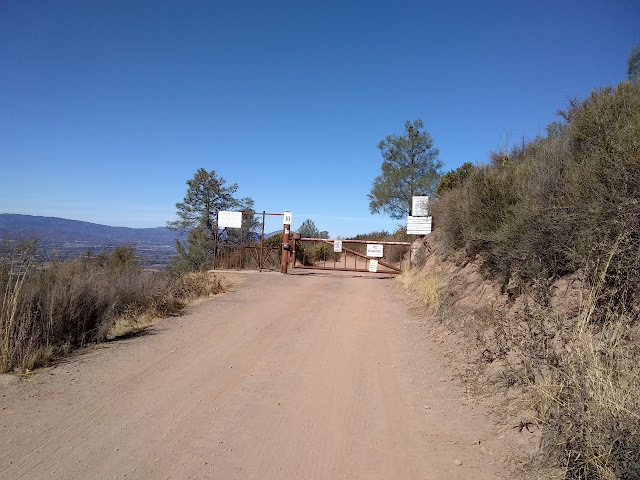 Somewhere up a steep two-way road with driving down one side and parking, paved around redwood trees, or non-existence down the other, I found a gate and a turnaround. There are maybe five parking spots within a quarter mile of it, but the top one was free and I grabbed it. On a bit of a hill with no curb to turn into, so with the break as tight as I can get it and in gear and a bit of thought about maybe a rock under a tire. The trail is easy to find as the continuation of the road behind the gate and signed if I'm not sure. The trail just continues the road. The paving only lasts to a water tank on the left. 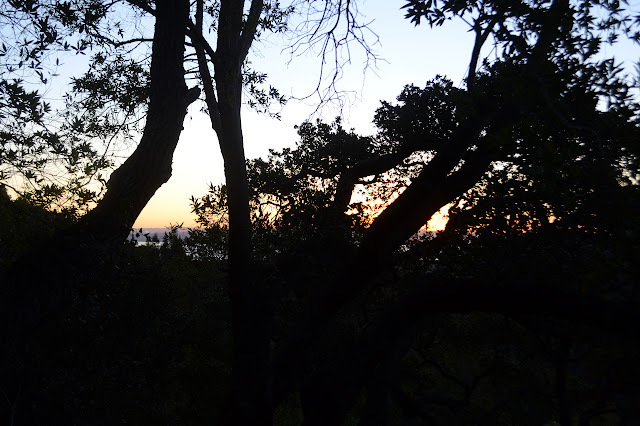 Getting an earlier start as the sun just tops the mountains on the other side of the bay, which is just visible through the oaks. The Wilson Way Trail quickly connects up with the loop around King Mountain. Since I suspect it might be dark on the way back, I'm not really certain how many miles I have set before me to hike today, I will start off with the loop. 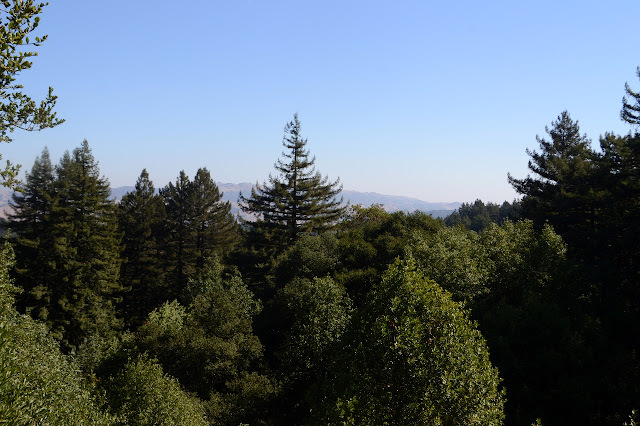 I hand a right to better views of the bay through oaks and bay laurel on the south and east and through young, tall redwoods on the north side of the mountain. The loop has a few runners on it for the morning and, unless he has a twin, one guy is even doing laps. The goal for today doesn't look that far away. 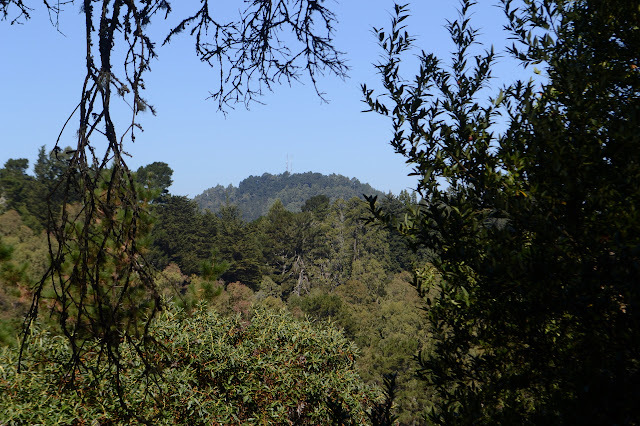 The little box of a fire lookout at the top helps definitely identify this as the west peak of Mount Tam. Skyscrapers in the mist are from San Francisco. There seem to be just a few distinctive skyscraper islands to pick out just like when hiking in the Los Angeles area. A better view out over the bay including the bridge to Richmond. 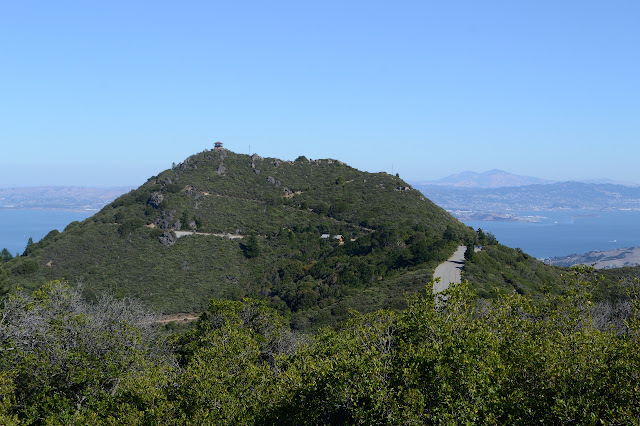 Turns out that last peak, Wildcat Peak, is on a peak list called the San Francisco Bay Area Nifty Ninety. Nifty. I've actually already gone up a couple on it without noticing the list. Nearby to it is another called Round Top. This is, apparently, the remnant of a volcano that erupted about 10 million years ago and now has been pushed over onto its side by the local tectonic forces for the joy and education of geologists. Some local quarrying operations have also helped out in uncovering information about the volcano. Just in case this makes visitors start thinking, "Well, let's learn about volcanoes!" the maps that can be found online and at the staging locations include interpretive trail information to do just that. My first instinct is to start at the Old Tunnel staging area, but since it is the weekend, I head for the spot with the most spaces and only get one through rather good luck. The place is packed, but the chatter indicates this is a rather unusual condition even for a nice day on the weekend. 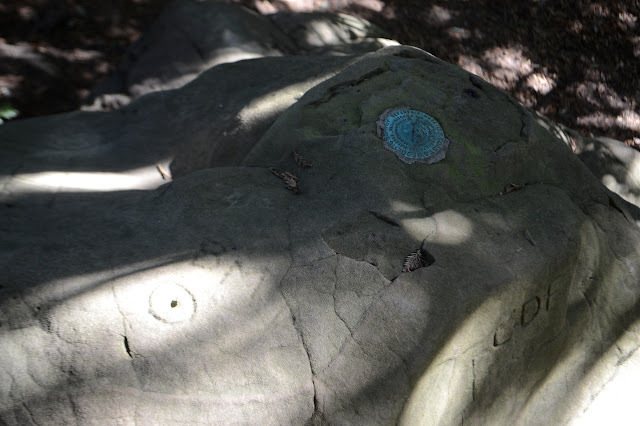 I grab a copy of the map, check out the labeled rocks on display, then head up to "geological marker 1" as the first stop on the guided tour of the volcano. It is around the back of the water tower past a rather nice view out over most the preserve. Just one small section of the crowded parking lot on the way into a bit of forest. Overview of the sideways volcano. It is not an especially obvious thing from here. There's been some shuffling going on and then other shuffling and driving a truck halfway across the north end of the country and then being more than done with that and I really need to get a hike going. 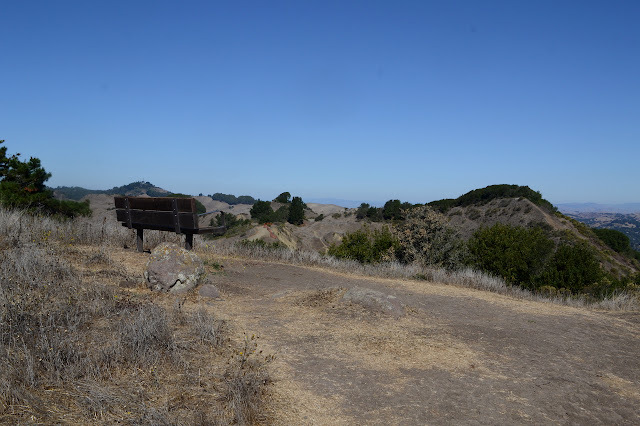 What is near at the moment and big enough for an all day extravaganza is Wildcat Canyon Regional Park, one of the East Bay Regional Park District's parks. They have a site for each of their many parks and supply PDF maps, so it is easy to plan something. I planned to go up Wildcat Peak with plenty of ridge journey on the way and canyon journey on the way back starting from a handy end of a random street that has access and, as it turns out, pretty easy parking even around 10 AM, which is a little late for starting an all day extravaganza. Getting started on the fire road. The web site lists complicated hours by month, but the sign here just wants us out between 10 PM and 5 AM. 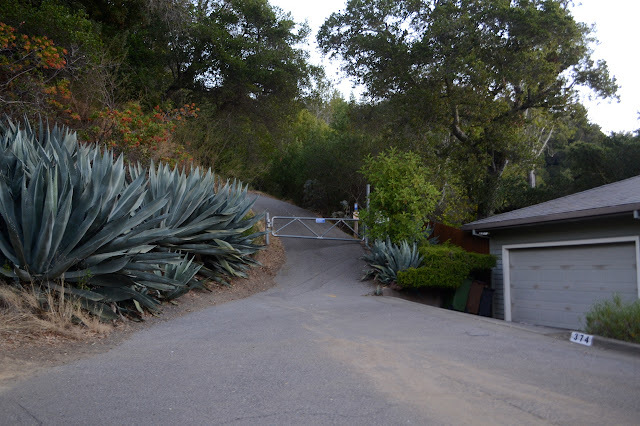 The road has a locked gate, of course, with a latching hiker gate to the side. The area is rolling hills of dried grass dotted with tufts of trees and stands of chaparral. 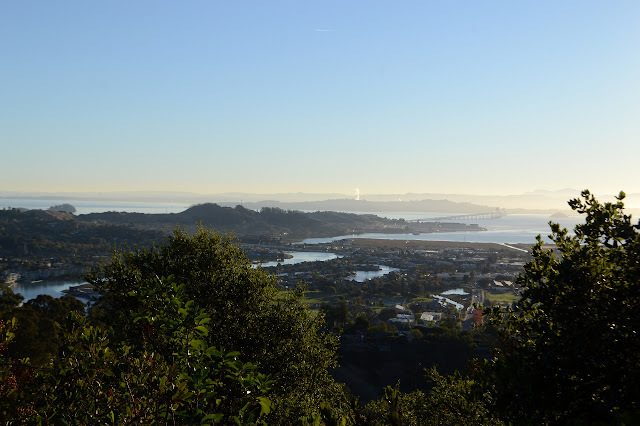 The San Francisco Bay becomes part of the view quickly. Oh, and there are cows. They are supposed to be here. Just a part of the park. Islands in the faintly foggy San Francisco Bay from the gate. Handy signage to help me get in a longer hike than just to the "dead end". Up ahead, a few trees.